Beyond pride, the biggest issue keeping adults off small motorized scooters is the fact that their tiny motors usually don’t have the power to move anything heavier than your average eighth grader. That didn’t stop [The_Didlyest] from snapping up this $7 thrift store find, but it did mean the hot pink scooter would need to be beefed up if it had any hope of moving 170 lbs of hacker. Logically, the first step was fitting a more capable motor. [The_Didlyest] used an electric wheelchair motor which had a similar enough diameter that mounting it was fairly straightforward. The original sprocket and chain are still used, as are the mounting holes in the frame (though they had to be tapped to a larger size). That said, the new motor is considerably longer than its predecessor so some frame metal had to be cut away. This left the scooter without a kickstand and with a few inches of motor hanging out of its left side, but it’s all in the name of progress. 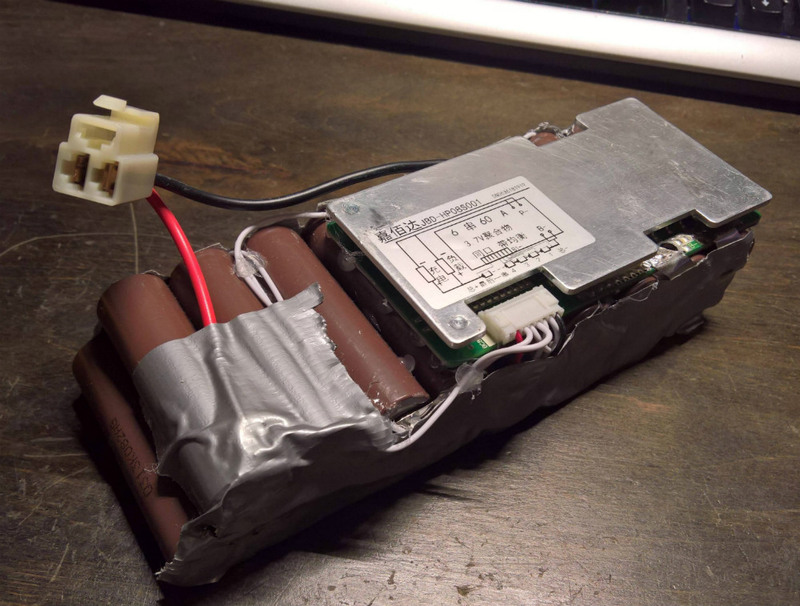 Naturally the upgraded motor needed similarly upgraded batteries to power it, so [The_Didlyest] put together a custom pack using eighteen 18650 cells spot welded together for a total output of 25V. Coupled with a 60A battery management system (BMS), the final 6S 3P configured pack is a very professional little unit, though the liberal application of duct tape keeps it from getting too full of itself. Unfortunately the original motor controller consisted of nothing but relays, and didn’t allow adjusting speed. So that needed to go as well. In its place is a homebrew speed controller made with three parallel MOSFETs and an Arduino to read the analog value from the throttle and convert that into a PWM signal. [The_Didlyest] says the rear tire is now in need of an upgrade to transmit all this new power to the road, and some gearing might be in order, but otherwise the scooter rebuild was a complete success. Capable of mastering hills and with a top speed of about 10 MPH, the performance is certainly better than the stock hardware. Of course this is far from the first time we’ve seen somebody put a little extra pepper on a scooter. Some of them even end up being street-legal rides. I thought electric scooters were now free to all comers, on any street corner in a trendy enough US suburb? Legally, no. But they’re just sitting there, “free” for the taking. Or at least they were. Here in Portland, Oregon, they’ve disappeared as quickly as they arrived. Test phase is over, I guess. Should have used the motor from a hoveround, then he could have visited the Grand Canyon. I literally blew up my home brew arduino controlled scooter controller made with parallel IGBTs. It worked great for about 3 hours, then it made a loud pop and smoke poured from the casing. There sat the three with the fronts blown off of them. By the time it’s finished, zero parts from the original $7 scooter remain. Maybe put a better motor in there? Is that a 3 cylinder gas rotory engine? Yes it is. Type LiquidPiston™ into Google Search. Don’t leave us hanging! What is the thing on the left? So, it looks like an “inside out Wankel” (3 lobes on the block, 2 lobes on the rotor). To me it looks like it has the same problem with rotor side seals like the Wankel? Sort of an inside-out Wankel, with a two-lobed rotor inside a 3-chamber case, instead of vice-versa. Oh, but the rotor has an air passage, like a rotary valve. My grandfather’s axe is great. Sure, we had to change the head a few times, and the handle after it broke, but my grandfather’s axe is the best. Right! As long as there’s continuity of existence, it’s still your grandfather’s axe. I agree with what you say completely, but at that point you could reassemble the original and now have 2.. only to start the process over again. To me that’s part of the fun in making/upgrading projects. Is this not similar to the average computer user? I know many people with 4.. 5.. even 15 to 20 working computers, in-use, at any given time. Not one of them has ever claimed to have purchased them all at once, or even purchased them all as complete/working units. -Ronald Reagan, though he may not have originated the saying. You scooter hacks are geniuses, but all for 10 mph? Hmmm…what would it take to get 30 mph and a lengthened wheel base so you don’t endo when you hit a 1/2″ pebble??? I have a feeling you guys are going to come up with something so good that the Chineese steal it and reproduce it with inferior parts in their sweat shops. What if Willy Wonka steals it and reproduces it with crystalline parts in his sweet shops? Ok upgrade, however I’d be careful with that thing. If motor and wheel are designed for kids probably frame and bearings are also not suitable for heavier person. 10mph??? These same scooters used to go 20mph out of the box! I am 200 pounds and my son & I would take turns for a good 40 minutes on a single charge. I don’t think I would consider this a hack considering …10mph ah jeez!